Arya has already seen two Sandra Boynton books about animals. Birthday Monsters by Sandra Boynton was quite different. Birthday Monsters was the most unusual children’s book we have read thus far. The juxtaposition of the monsters with a birthday celebration made for an entertaining and enjoyable read. The plot centers around five birthday monsters and their hilarious antics. After messing up the house and disappointing the protagonist (who looks like a hippo), the birthday monsters return to clean everything up. Unlike other children’s books which make the fantastic seem too real, the story of Birthday Monsters is so utterly ridiculous that even the youngest children will grasp its premise. The entire book reads like a slapstick comedy targeted at kids. As with all Boynton books, the illustrations are top-notch. Each birthday monster has a unique color and every page shows funny pictures in a hand-drawn style. Birthday Monsters is written in a fast-paced rhyme. While the vocabulary is simple enough for kindergarten-age children to understand, the book is clearly meant for an adult to read to a child. The text relies on pacing–similar to lyric poetry–to build excitement and emphasize the humor in the birthday monsters’ actions. 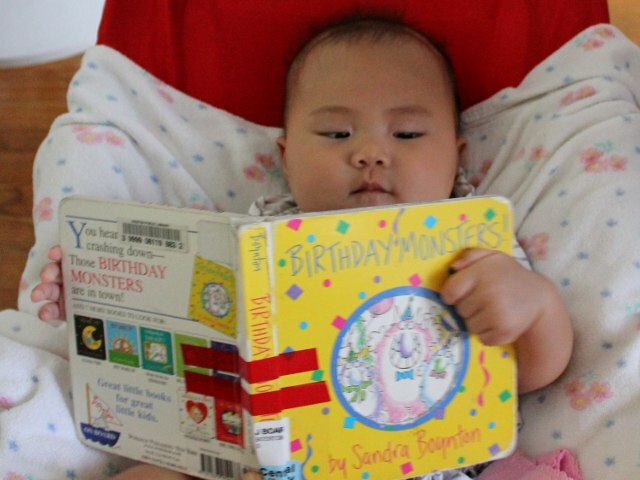 Young babies like Arya will like looking at the illustrations regardless of who reads the book to them. But the book is particularly entertaining if an adult reader is willing to read it in a fast-paced, upbeat style. Middle-school children may also benefit from reading the book to younger siblings. Birthday Monsters costs (including shipping) $6.95 new and $3.99 used from Amazon.